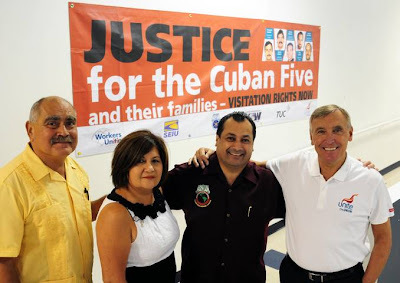 On August 13 more than 200 workers, labour leaders and community activists came together at the United Service Workers West (SEIU) Hall to participate in an event in solidarity with the Cuban 5. Coincidently that same day Rene Gonzalez one of the five spent another birthday in prison far away from his love ones. As part of the event those attending were able see the travelling exhibit of Gerardo Hernandez's political cartoons entitled Humour from my Pen. 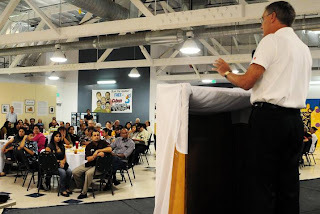 During the event the participants watched a short video of Danny Glover and another video of the campaign of the British unions in support of the Cuban 5. The significance of this meeting was that it marked the first that a union from the US organized an event solely to inform their rank and file and the leadership about the colossal and ongoing injustice being committed against the Cuban 5. The purpose of the event was to expand the exposure of the case that is boycotted by the media, to the US labour movement and to ask them to join the struggle. Tony Woodley, former president of UNITE, the largest union in England, who travelled all the way to Los Angeles to participate in the event spoke about the importance of solidarity. "Make no mistake about it this is an historical event," Woodley told the crowd. 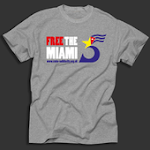 "The Cuban 5 enjoy a great deal of support on the international level but that is not the case inside the United States. The solidarity is absolutely crucial in this case and the political struggle will be decisive for the return of the Five to Cuba." 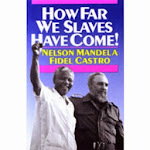 Woodley shared with the audience an emotional meeting he had with the families of the Five on his last visit to Cuba. "The Five and their families are all people with great pride and nothing will break their spirit." Workers and union leaders present at the meeting represented a number of unions from Southern California including service workers, transportation workers, teachers, musicians, healthcare workers, electricians and others. Mike Garcia president SEIU-USWW welcomed the audience and reminded them that the struggle is the only tool that the workers have in their fight for justice. "The struggle for the freedom of the Cuban 5 should be part of the struggle of US workers because it is part of the same fight." Cristina Vazquez from Workers United briefly explained who the Cuban 5 were and went on to say, "Many of you are learning about the Cuban 5 for the first time at this meeting because this story has been kept out of the news media. Every day we fight against injustice and one of our biggest struggles has been the reunification of families and immigration reform. This fight is no different than that; here we have wives, children and parents who have been separated for 13 years. We need to be the voice of the families of the Cuban 5, we need to be the voice here for the people of Cuba who want their 5 heroes back home." Vazquez encouraged the audience to pick up postcards designed by the union she represents to be sent to President Obama asking for the release of the Five. Alicia Jrapko from the International Committee for the Freedom of the Cuban 5 spoke about the different campaigns in the US to spread the word about the case. Jrapko explained to the audience that this is a case of human rights and basic justice. "These men came to the US unarmed simply to defend their country from terrorist attacks coming from US soil. With a stroke of a pen Obama can free them. Join us in demanding that." In recognition of the support from labour, members of the International Committee presented wooden plaques with the symbolic logo on behalf of the Cuban 5 to Tony Woodley, Mike Garcia and Cristina Vazquez. Another plaque was awarded to Natasha Hickman editor of CubaSi!, a publication in solidarity with Cuba produced by the Cuba Solidarity Campaign in the UK. An informational table with a display explaining the case of the Cuban 5 received a lot of attention with most people signing up to receive updates of the case and took with them hundreds of post cards to send to Obama. Many copies of the new documentary Will the Real Terrorist Please Stand Up were also purchased at the table. Mike Garcia, referring to the case of the Cuban 5, loudly closed the meeting by asking the audience several times Se Puede? And they responded each time louder; Si Se Puede!